Business rescue and recovery specialist Begbies Traynor has appointed Kris Wigfield as a partner in its Sheffield office. Joining the firm from Wilson Field, where he acted as its Sheffield-based national head of sales for five years, qualified accountant and insolvency practitioner Wigfield will focus on growing Begbies Traynor’s presence within South Yorkshire. He will work alongside fellow Begbies Traynor partner Gareth Rusling and directors Joanne Hammond, Ashleigh Fletcher and Claire Dowson. Julian Pitts, regional managing partner for Begbies Traynor in Yorkshire, said: “We are really pleased that Kris is joining the firm at an exciting time of strategic growth and development for us in Sheffield. He brings a wealth of experience of the regional market and will be a valuable resource for our clients in and around the city who require advice on restructuring, refinancing and insolvency. “Kris’s role will complement Gareth Rusling’s work on expanding our offering in Lincolnshire and I’m delighted to say that we expect to be able to announce the opening of a new Begbies Traynor office in Lincolnshire very soon. 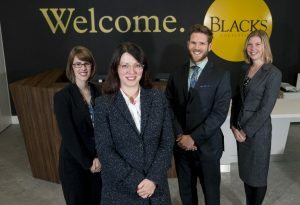 Leeds-based law firm Blacks Solicitors has recruited Rachael Donnelly into its property litigation team. She joins the team from DWF where she trained and qualified. With more than eight years’ experience as a specialist property litigator, and having acted on behalf of a whole range of clients, she deals with a variety of property management and land based issues and disputes. Her experience includes commercial landlord and tenant matters, such as lease renewal proceedings and breaches of covenant, possession actions, development and contractual disputes and advising and enforcing third party rights such as restrictive covenants and easements. She said: “I’ve specialised in property litigation since 2011 and I can’t wait to get started at Blacks. With its sterling reputation, friendly staff and brand new office space, it’s an exciting time to be joining the firm. Clarion’s costs and litigation funding team continues to grow with the appointment of its fourth and fifth apprentice paralegals. Kelsey Price and Casey McGregor, will study CILEX to qualify as legal executives at Clarion and will both train and specialise in Court of Protection costs. They are the tenth and eleventh apprentices to be taken on by Clarion since the launch of the firm’s apprenticeship programme just four years ago. Clarion’s in-house legal costs team regularly deals with multi-million-pound legal costs that arise from high-value personal injury, clinical negligence and commercial litigation claims. Clarion partner Andrew McAulay, who leads the costs and litigation funding team, said: “We are really pleased to welcome two new additions to our team, which is growing to meet ever increasing levels of demand for our specialised services. Since starting out in 2011 we have grown to 12 and we act for over 150 law firms across the UK.